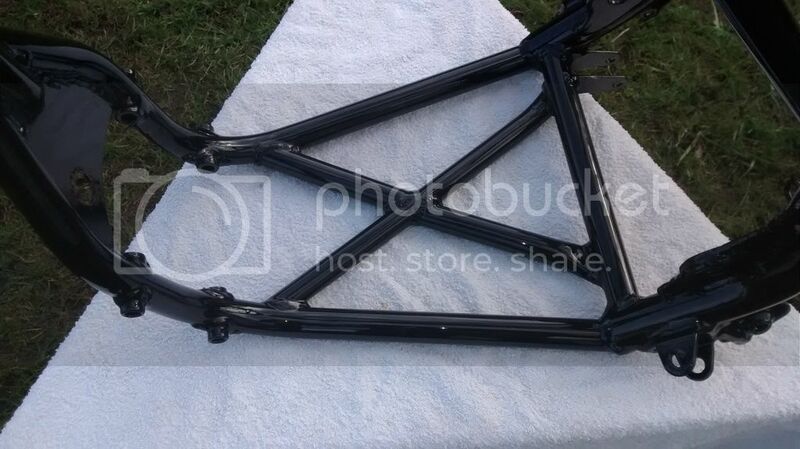 Just got my frame back from powdercoating after some srtrategic strengthening/bracing. Extra cross brace under sump, extra bit of webbing between the 2 frame rails (near exhaust headers), webbing and mount points beefed up at swingarm pivot, extra bracing around headstock. Hello Bludge. Just looked over your pics. 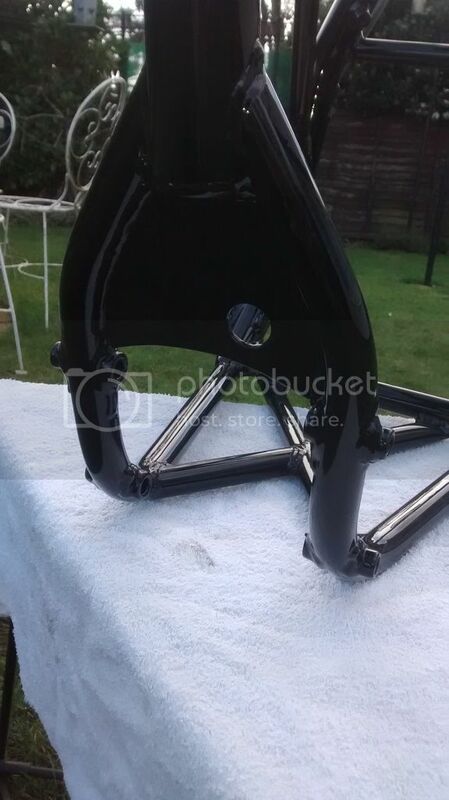 Can`t help wondering why a beefy Husaberg frame needs any bracing. It already is cro-mo tubing that doesn't fatigue, with a load dispersing design that doesn't have unwanted flex. You may find your bike has lost a bit of leaned-over tracking ability. The finish you got is superb though. Was there enough light in the welding shop? 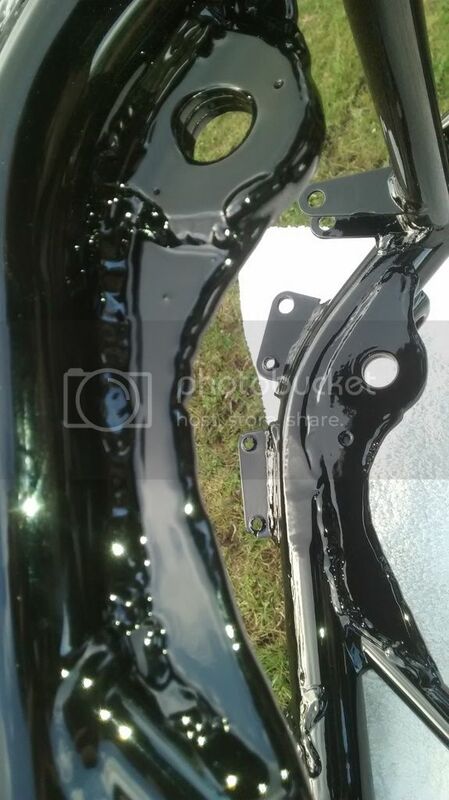 Although plenty strong, the welds look inconsistent. How do I know you ask? A career repairing and making parts for everything from 100 ton tank cars to suspension bits for RC racers, leaves one with a terrible burden of judgemental knowledge. I believe bludgeon has pretty much copied the factory race frame I have sat here. at least he's out there meddling and fettling! long may it continue! 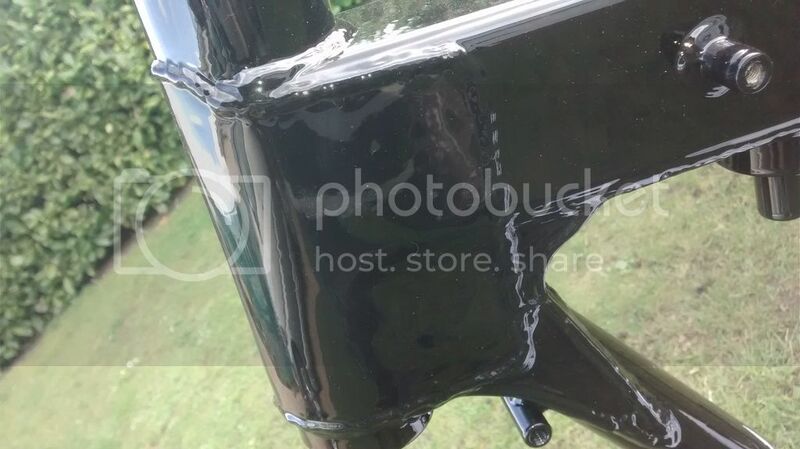 If you look closely at this pic, the extra bracing talked about is on this frame too. I'm assuming it's for Supermoto, where the extra grip from slicks may put extra stresses on the frame. I know Lazzarini rode a factory supported 700cc that had the steering head braced as well. 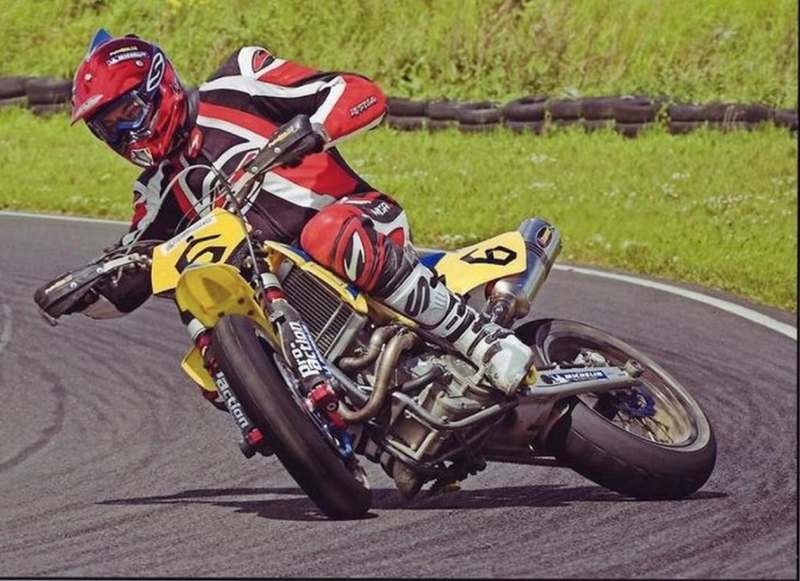 All in the name of supermoto racing! Yes Taffy, I basically copied everything I have seen/found about this. All of these modifications were done (probably better!) to Christian Iddons Berg back in the day - and many others besides. Turns out he was fairly fast! Interesting to hear your thoughts LV. 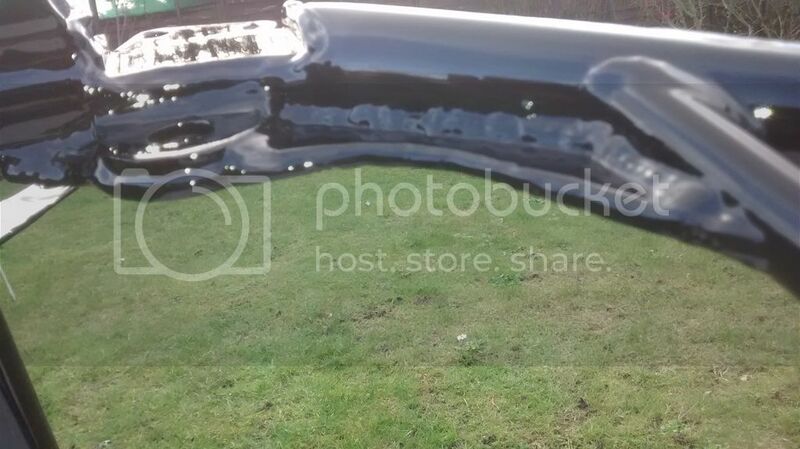 I wasn't too fussed about the look of the welding - told the guy it was function over form in this case! I spoke to Dave Clarke about these mods - apparently the beefed up swingarm pivot mod made a big difference getting the power down exiting corners (according to Christian). They're all tried/tested modifications in supermoto. The only one I couldn't do was Lazzarini's! Only because I haven't got twin pipes/headers, I'll add a pic below in case you've never seen it. I must say I'm not aware of the rear engine case breaking issue, I'll look that up. If you happen to know which Kawasaki axle nuts to look for, i'd appreciate it. What a weapon, apparently run a 19T front sprocket too! Yeah - I remember reading something about that. 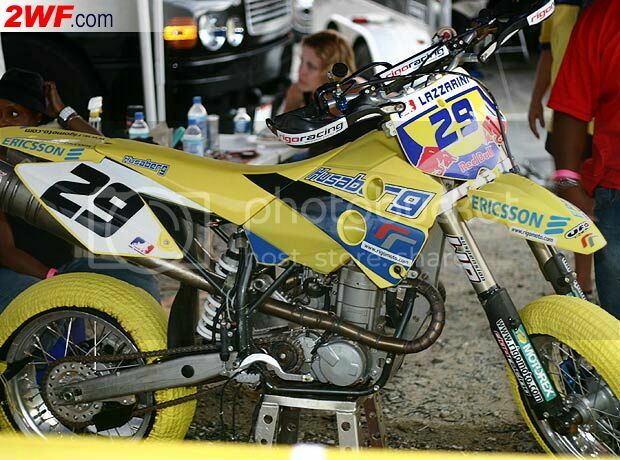 I think the swingarm needed modifying to run that 19T!